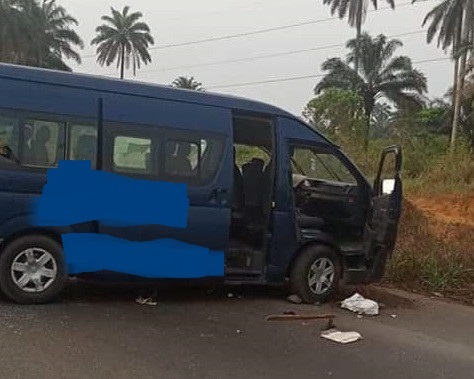 According to a Punch Metro report, unknown gunmen, on Monday, attacked a commercial bus, killing its driver and two passengers on the spot before abducting the remaining passengers in the Rumuekpe-Ndele area of the East-West Road, Emohua Local Government Area of Rivers State. It was gathered that the bus conveying passengers to Port Harcourt, from Warri in Delta State, was attacked in the early hours of Monday. An eyewitness, who did not want his name mentioned, said the unidentified assailants shot at the driver and two others after he (driver) tried to manoeuvre his way around the roadblock set by the gunmen. The source stated that the remaining passengers were immediately taken through a nearby bush. The number of passengers marched into the bush could not be ascertained as of the time of filing this report. It was learnt that the incident caused a heavy traffic on the expressway for several hours, with normal traffic flow only restored after the operatives of the Rivers State Police Command intervened and removed the bus from the scene of the attack. The source said, “Some gunmen attacked a commercial bus here today; they killed the driver and two other passengers, who I suspect were sitting in the front row of the vehicle. “The bus was painted navy blue; I guess it was travelling from Warri to Port Harcourt before it was attacked. The driver, I think, tried to escape and the bandits shot and killed him and two of the passengers. When contacted, the state Police Public Relations Officer, Nnamdi Omoni, confirmed that the gunmen killed the driver of the vehicle and kidnapped some of the passengers. Omoni explained that policemen swung into action and rescued some of the passengers, while others were still being held hostage by their captors. “I can confirm the incident today on Eat-West Road, precisely at the Rumuekpe junction, where unknown gunmen opened fire on a moving bus and the driver was killed immediately.